Manny Pacquiao proved the far superior once again as he seized the WBO welterweight title through a sensational twelve-round pounding of Jessie Vargas. Returning to the ring after a short-lived retirement in April, Pacquiao appeared to show no signs of age as he turned back the clock with a masterclass in counter-punching, speed and movement. Jessie Vargas acquitted himself well over the first half of the fight, but would be outlasted at the Thomas & Mack Center in Las Vegas. Roared on with chants of "Manny" around the arena, the Filipino was the aggressor right from round one, with the typical cagey opening featuring some straights to the body before Pacquiao was able to creep in an uppercut, although Vargas would counter with not much action to soak in from in the first three minutes. Both combatants were willing to unload their firepower in the second frame, with the challenger looking to creep in shots from a southpaw stance, responded with a scattering of body shots. Pacquiao's counter-punching abilities would be displayed at their best when he moved out the way of a jab and popped a short straight left sending Vargas down on his seat on the canvas. He got back up, with a smile on his face, and still found a few openings through the guard, but Pacman was looking fluid. While being able to grin it off earlier, concern was soon plastered over the face of Vargas who was beginning to encounter more and more trouble as his opponent grew in confidence. He was being beaten to the punch at most exchanges, but did land on Pacquiao even if they were the lesser of the significant punches. A right hand did force the legend back, but he wasn't too fazed by moving around with assertion. Jessie Vargas did manage to give himself a much bigger shout in the fourth round, with a thumping straight right hand the exclamation mark for his improved work. 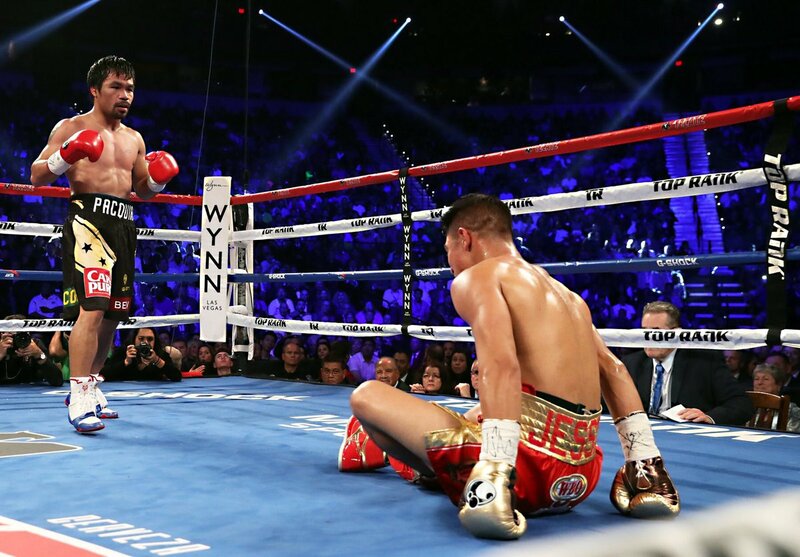 After a period of clinching, and some shots coming off the arms of Pacquiao, Vargas was swinging, and unlike his left hook, he was looking more dangerous with the right hand, finishing the round with another solid blow. Things continued to look more competitive as the rounds ticked on, with Pacquiao's defence for the most part holding up as he deflected the punches including a big left hand. With Vargas now sporting some of the damage after five rounds, he looked for body shots on Pacquiao - with the Asian fighter managing to stay out of range with ducks for the most part but still would be clipped at the edge of the range. The right hand continued to look dangerous, with a swift one connecting early even though the all-time great didn't seem too bothered by it. 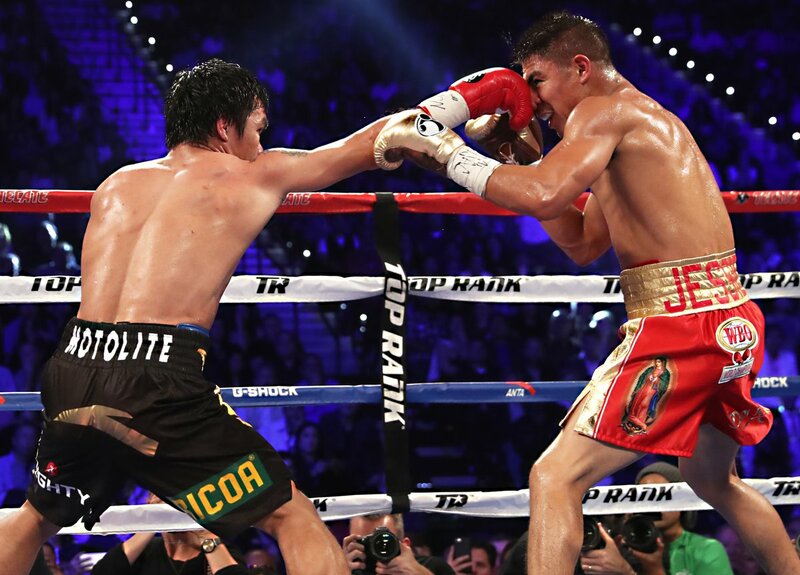 Vargas was beginning to control the fight more at its midpoint, but the pace set was taking its toll - an increase of clinching was mostly occurring as Pacquiao ducked into his arms. More bodywork got the champion on the scorecards, and a late big shot did more of the same - but Pacquiao didn't show too many signs of damage as he once again sprung to his corner. The tide seemed to turn in favour of Pacquiao in the seventh with a cluster of jabs really frustrating Vargas. Lightning fast speed to get in and out even had him signalling his hands to will the fight on. As it would turn out, Vargas was leaving his head out a plate for Pacman to jab away at. A captivating eighth stanza had fans on their feet with both Pacquiao and Vargas enjoying big moments. They continued with their high energy output, but Pacquiao would pay for it when he was staggered with a thunderous right hand as Vargas moved out of the way of a jab. 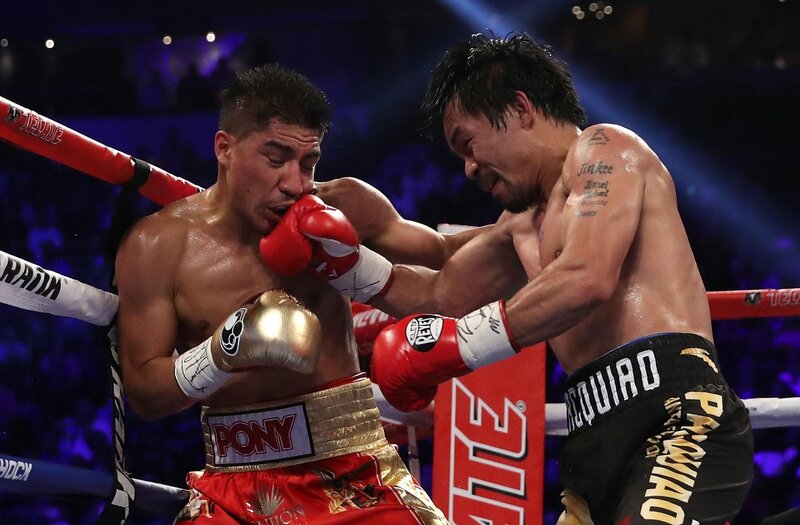 Experience played a huge difference as Manny was able to weather the storm and survive, before coming back with some fire of his own as he forced Vargas backwards with a mesmerising combination - also featuring a clash of heads which would contribute to the wounds on the American. Pacquiao peppered him with a few jabs to close out the round, and with four left the fight was anyone's for the taking. 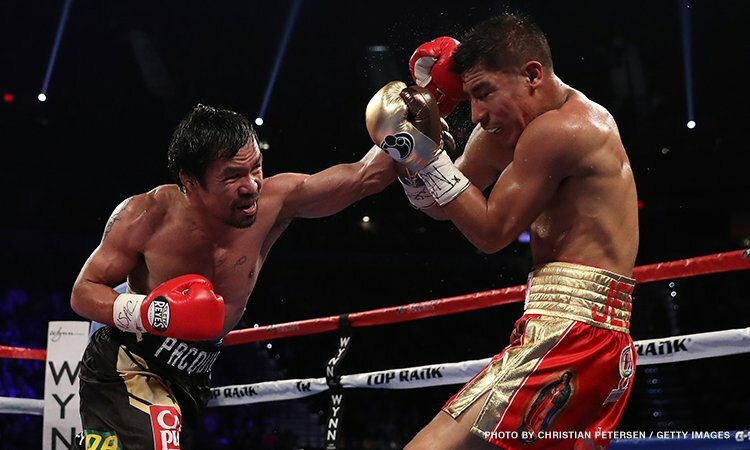 In need of some major rest bite, Jessie Vargas appeared to take things down a tone while Pacquiao's crisp jab continued to score. The cardio of the champion seemed to be under question with four rounds left. After 10 rounds of boxing, Manny Pacquiao had appeared to crack the code: avoid the right hand, and jab away - with an addition of fantastic movement as well. Vargas appeared to have a lot less left in the tank as he was continuously knocked with jabs while he was aware of the danger by ducking away from the right hand immediately. Manny Pacquiao spotted that Vargas was beginning to cave in and opened the eleventh frame with a storm of aggression, nailing a left hand as he stepped into it. He was seeming fired up which was incredible considering the pace he had upheld throughout the contest, and then there would be a stumble back towards the ropes. Pacquiao offloaded further big shots to close things out, and what seemed like a late knockdown wasn't, with Vargas tripping over the Filipino's foot. In the final round, Manny put his foot on the gas while Vargas, with daylight now separating the two athletes, Vargas loaded up on the right hand but just couldn't cultivate anything to salvage the fight. A late slip on to his knee wouldn't go as a knockdown, but the fight was wrapped up with Pacquiao continuously growing into it, still fresh and ready to have gone 12 more. 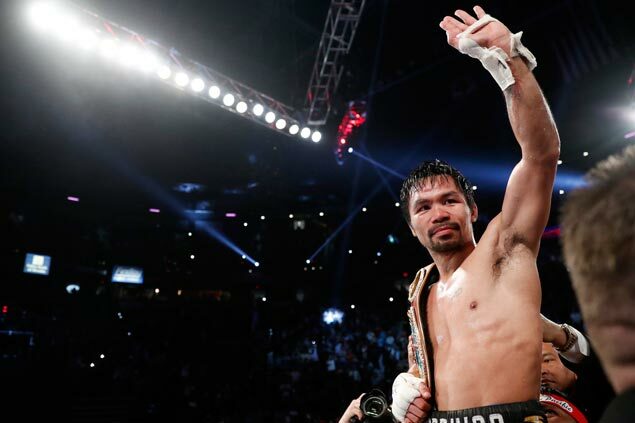 114-113, 188-109, 118-109 all in favour of Manny Pacquiao, WBO welterweight champion for a third time and coming out of a short-lived retirement with an incredible statement. Jessie Vargas was a hungry, unafraid champion - but 37-year-old Pacquiao outran him by a proverbial mile.